Hot news! 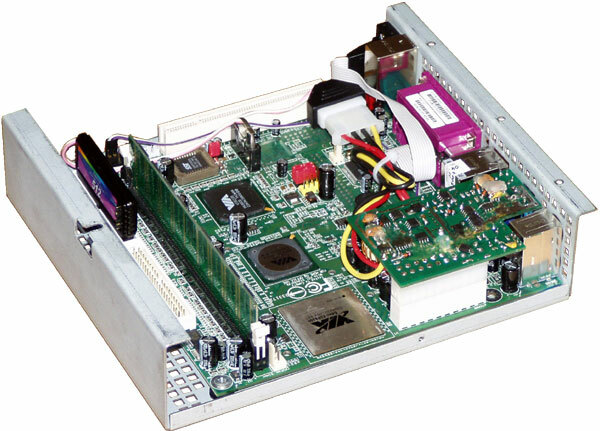 August 7, 2007, we announced our newest product: DW67 - Wallmount Chassis for Mini-ATX form-factor book-size computer. Fanless design with excellent CPU and system cooling! Improved mechanical strength! Comfortable attaching! Tiny & Stylish case can be applied as Thin Client, NetWork Device, Set-Top Box, VPN, VOIP and POS system. 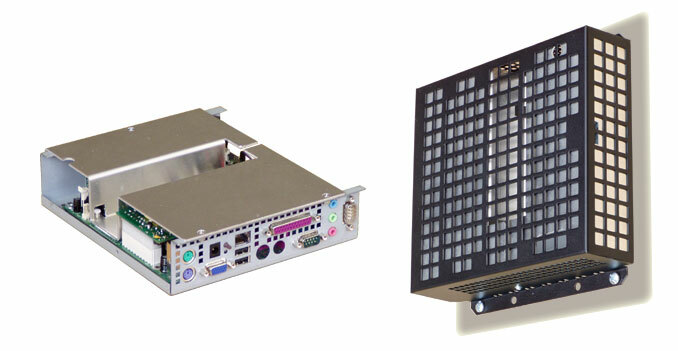 Large aluminum heatsink for good heat solution provides operation without CPU or case cooling fan and it can reduce the risk of fan system fail possibility. It is cunningly designed to minimize size and as such has no space (or real need) for a HDD. Use Flash Disk On Module to overcome this problem. It's designed with mounting holes that allow it to be securely mounted onto desk, wall or on the VP1 plate and then directly on the back of most LCD display designed to support VESA mounting standard. Along with it's fanless design, DW67 can be adapt and use in a wide range of applications (see Application notes here below). 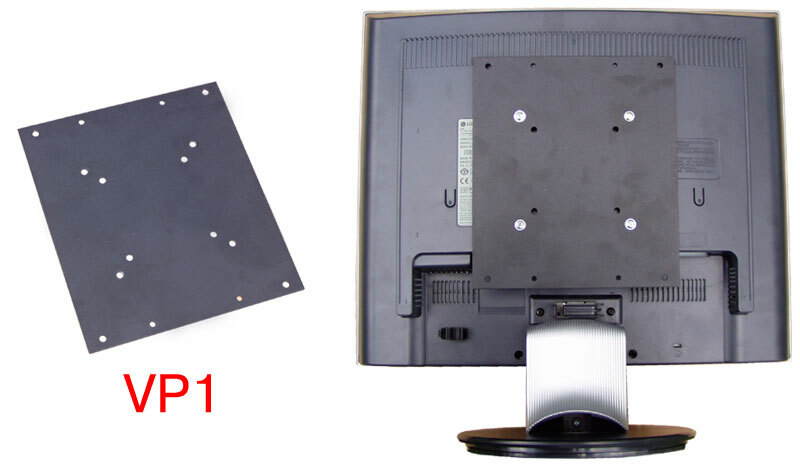 Use only specially designed VP1 plate in order to attach the DW67 to LCD monitor (see VP1 plate on the left picture). 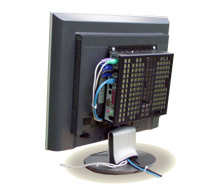 VP1 plate is designed with mounting holes that allow attachment to any VESA 75 or VESA 100 mounting fixture, allowing it to be securely mounted onto the back of most LCD monitor designed to support VESA mounting standard. 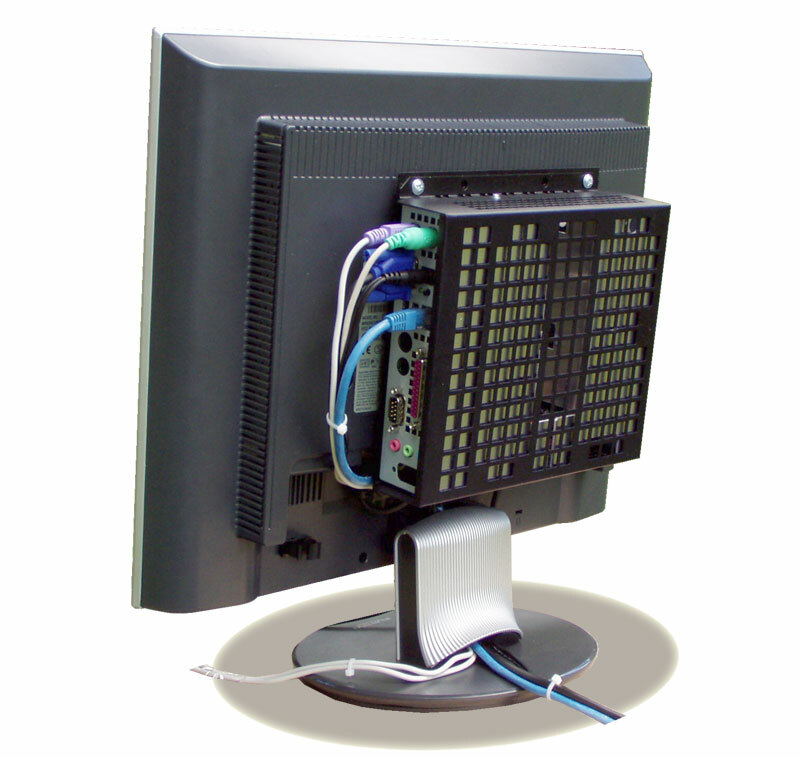 Install the VP1 plate to your LCD monitor (as shown on the left). VESA mounting screw holes have an M4 thread and are typically 10 mm deep. Using M4x8 screws and M4 nuts attach the DW67 based system to the VP1 plate as shown on the left picture. Look at your LCD. You turn your PC into an invisible device! More information about VP1 plate take here. VP1 plate is supplied as option, but it is advisable to order required VP1 plate together with the DW67. Since VP1 plate is a optional item, you may purchase it at additional cost. Use VB1 bracket, if your LCD monitor with attached DW67 should be handled to any VESA 75/100 arm (as shown on the left). The VB1 comes complete with two hole sizes: one for 100mm VESA and one for 75mm VESA mounting. More information about VB1 bracket take here. VB1 bracket is supplied as options, but it is advisable to order required VB1 bracket together with the DW67. Since VB1 bracket is optional item, you may purchase it at additional cost. 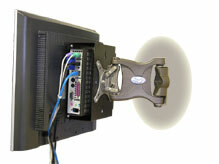 Leave airflows outside your LCD monitor with attached DW67 free from wires and another obstacles. Adjust the airflows of cool and warm air outside of the DW67 and monitor with corresponding airflows inside the DW67 and monitor. 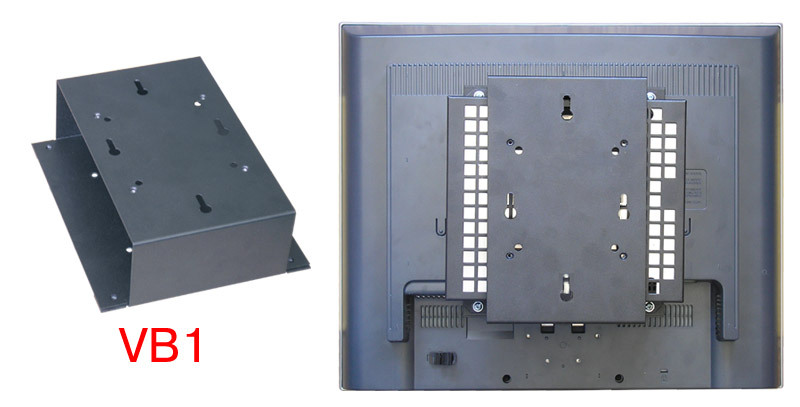 Use bracket VB2 (photos on the left and below), if your LCD has four screws foot mounting 75x75mm, 100x100mm or 200x100mm. 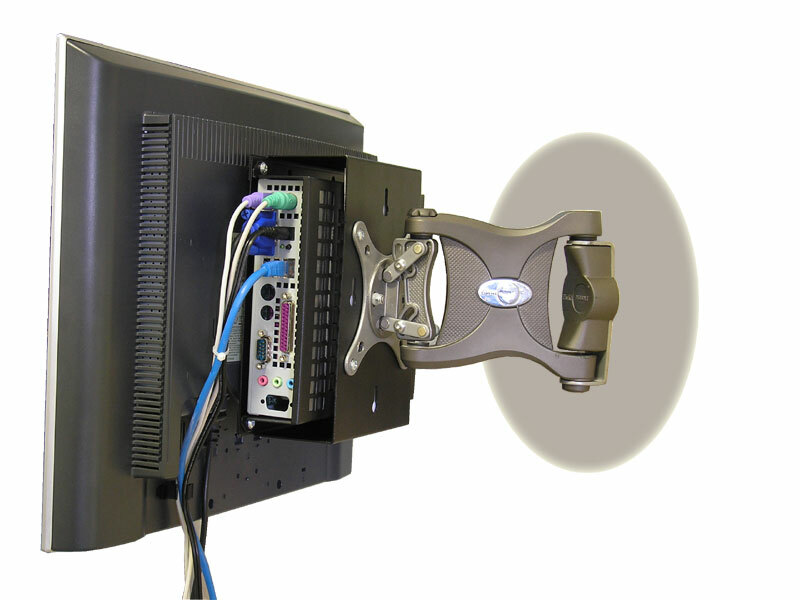 VB2 plate is designed with mounting holes that allow attachment to any VESA 75 or VESA 100 mounting fixture. More about bracket VB2 read on link. VB2 plate is supplied as option, but it is	advisable to order required VB2 plate together with the DW67. Since VB2 plate is a optional item, you may purchase	it at additional cost.